It certainly has not been proven that everything which begins to exist must have a cause. Lots of things do, but if experience has taught us anything it’s that our observations are limited and generalizing can get you in trouble, especially in areas you cannot conceivably test (such as the rather broad spectrum of “everything”). As soon as one premise fails to be completely established, the deduction fails and the argument is of little use. 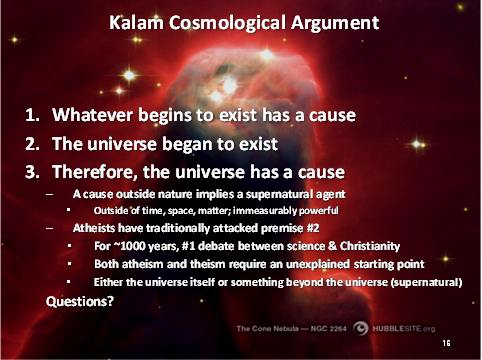 There are obvious additional flaws as well – namely that most theologians will exempt God from the first premise (saying something like, well, He didn’t begin to exist, He always existed, and therefore doesn’t need a cause) but that begs the question and assumes the conclusion the argument is setting out to prove. Then of course there do seem to be examples in physics of things coming into existence without causes – see Victor Stenger. The verdict’s still out on the the universe having a beginning (that is, there are scientifically consistent models describing situations in which the universe does not have a beginning). And, just for kicks, even if we were to accept the premises as all true, it wouldn’t get us any particular God. You would still have all the work ahead of you to demonstrate the truth of Judaism or Christianity or Islam or any tiny, single, pitiful attribute of any creator. Well. Waters it down a bit, no?